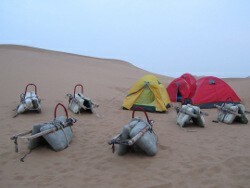 This morning we had a very weird (included) breakfast at the hotel and then checked out, left our bags at reception and headed off to the Tengger Desert. We drove for a while before we met up with our camels, I named mine Alice :) They were 2 hump camels (Bactrian) and looked pretty mangey, but that was apparently because they are shedding at the moment (weird). This was *way* better than the brief camel experience I've had in Egypt or Morocco and was way more like what I'd been expecting in Morocco for our night in the Sahara. We rode for just over an hour, I think (but it did feel like longer), before we stopped in a random spot for lunch. It is definitely tricky trekking far enough away to find a spot to go to the loo! They set up an umbrella for us so we had some shade to sit under. We must've been stopped for a couple of hours before we set off again. And then another ride thru endless dunes (well, not really, sadly. We could see a nearby town from the top of a nearby dune when we stopped for the night). It's really a very relaxed ride. When we found our spot for the night, we sat around for ages nibbling on the snacks we'd brought, not really sure what was going on. Our one camel-guide went and sat on top of a high nearby dune and seemed to be keeping and eye out for whoever was bringing out tents, sleeping bags and dinner. We eventually got bored of sitting and did some dune climbing ourselves. The sunset was less than impressive with the sun disappearing in the sky (behind thick clouds) long before it even reached the horizon. Our tents and dinner (and beer) finally arrived and we set everything up, ate and sat around chatting. Sadly we didn't have a bonfire or anything, which we were expecting because we were hoping to make smores (like I did in the Sahara overnight). But, the chocolate was individually wrapped and completely melted so we managed some make-shift smores anyway - hahaha! We also tried some Baijiu (rice wine, I think), which was *awful*. Seriously, avoid the stuff! The stars were also not very impressive either because some cloud moved in at around dusk.